There has been a recent rise in the popularity of charcoal tooth whitening. But with more and more people trying it out, have we really stopped to think about the associated risks? I have recently read a number of articles that have been appearing on multiple social media platforms about charcoal teeth whitening. It seems that we are all still obsessed about having whiter teeth, and I’m not sure why. I agree that darkened teeth look unsightly but sometimes teeth that are too white can look odd as well. Perhaps it’s celebrities who want to make it big in America? Who cares? The fact is that tooth whitening is a billion pound market and charcoal is being pushed to the fore recently. I personally have seen articles in Vanity Fair and Cosmopolitan, to name only a couple. Charcoal treatment for teeth is actually an ancient treatment. Apparently Hippocrates was a fan in 355 BC, but it was the Greeks who took up charcoal and ash with enthusiasm, using their fingers or laurel tree tooth brushes to clean their teeth. Do not make the mistake of buying any old charcoal. You need to have activated charcoal. Apparently activated charcoal is used to help rid the body of unwanted toxins and it becomes activated when high temperatures combine with a gas or activating agent to expand its surface area. There is evidence it can help prevent a hangover if taken in a different form. But can it whiten teeth? Evidently it can. However, I was given some very sensible advice about this recently. Look at it this way; if it was scientifically proven through rigorous clinical trials then all the main manufacturers would be selling it. The fact that none are selling it is not a sign that the big corporations are behind the times. It’s because potentially, it may cause more harm than good. This is because the charcoal may well strip the enamel from your teeth so they may look whiter, but they may not last as long and you may have more long term problems. 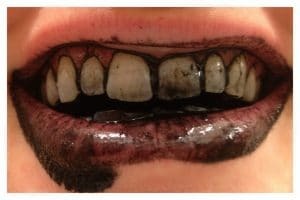 The advice according to some dentists is that if you’re going to use charcoal, do not use it for long periods and only brush with it once a week at the most. If you really want whiter teeth then talk to your dentist and don’t go for a cheap option. It won’t seem cheap when you have to pay for restorative treatment later in life. If you have had a troubling experience with a dentist please contact us. The damage done may not be seen until many years later when it maybe too late to do anything about it.